I know I said I wasn't going to do anything for Halloween...I was too busy with fall stuff this year. However, I found the bolt of Trick or Treat ribbon in one of my storage bins and a whole roll of the orange mesh in my attic and just had to do something with it! I remembered seeing this Trick or Treat sign at Hobby Lobby and went to check it out. Turned out it was perfect for the centerpiece! While I was there I picked up a bolt of the small black mesh ribbon and shear orange ribbon half price. Later on I remembered the spooky light up eyes I found on closeout for $1 each and thought they would be fun to add in the wreath. I just love the mesh and ribbons together! So fun and fluffy! The Trick or Treat sign is just perfect with the ribbon! I can't wait to light these spooky eyes up on Halloween night! That will most likely be the extent of my Halloween decorating, except for carving a few pumpkins. I can't believe Halloween is on Monday! Where did the time go? I've got to start on Christmas soon! Oh my! It's time to share your creations! I hope you will join in the fun this week! This week I am featuring tablescapes and Halloween crafts. 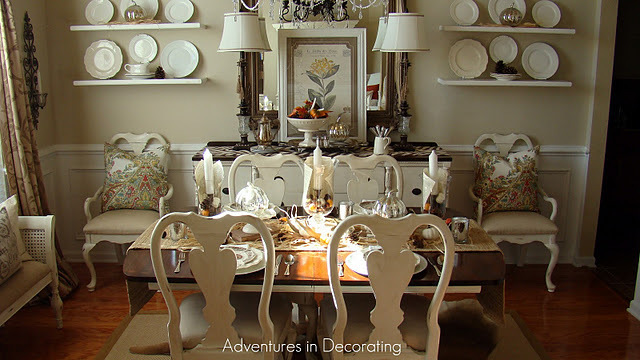 This beautiful tablescape was created by Pinky at Designs By Pinky. It just glows with beauty! 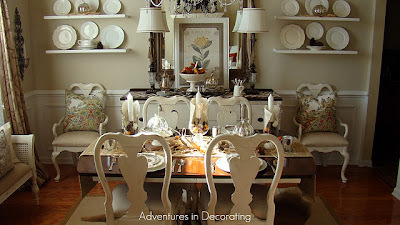 Becca at Adventures In Decorating just recently redid her pretty dining room. It really sparkles in white and silver. Love it! 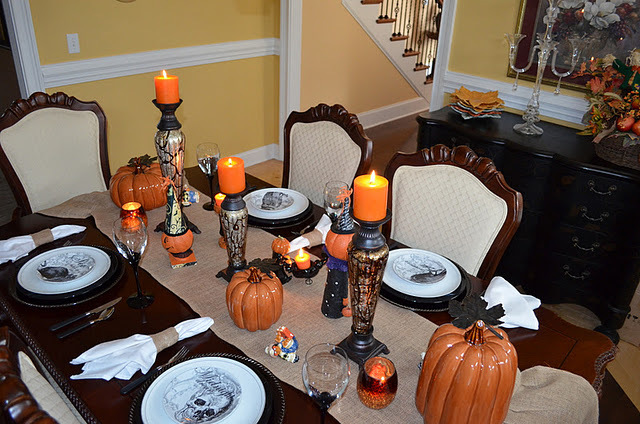 This fun Halloween tablescape was created by Jo at Jo's This And That. Great job! 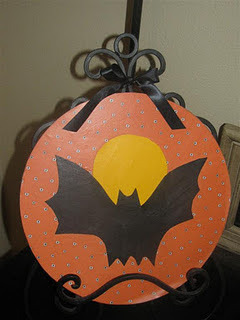 This cute wooden modge podged bat was created by Sally at Love Of Homes. Yum! This fun jellybean jar was decorated by Lisa at Buttercup Bliss. Cute! I do have some arrangements I just listed on Etsy to show you though. This one got a bit of a paint job...He looks good now. I just found this one the other day, love his tail! This one is really pretty too...I added a little gold to brighten him up! Well, maybe their all not roosters! lol...I sold her mate and she needs a home now! I still have a few fall arrangements left. I have priced them very well!! To check out my items you can visit my Etsy store HERE. You can link any item you have created, any room or outdoor space you have decorated, any piece of furniture you have painted, recipes...and the list goes on and on. Also, if you have an Etsy store you are welcome to add a link to your store on your blog. All I ask is that you add a link back to my blog so others can find the party. It's finally done! As you guys know I posted that I was working on this room several months ago. Well, it has really taken alot of creative thinking...especially in order to keep those green walls! lol...You know I was doing everything possible not to paint! I just did not want to mess with it right now. I also like green and black together...it makes a cool combo. However, it did pose some challenges in here at first. The first thing I found was the picture behind the bed. I had this picture in mind with the records behind it the whole time. However, I bought black bedding and pictured colorful pillows all over the bed. NOPE! It was way too much black and I could not find any fabrics for the pillows that looked right. So...on a whim I bought the black and white bedding at Wal-mart hoping it would tie in with the circular pattern of the records. This was MUCH better! I had the black and red pillow made, it adds some color to the bed. To make the record/picture combo I hung the picture on the wall first. Then I nailed the records all around the picture alternating them closer in and out. I found the lamp base, shade and table at Target. The lamp base was on sale for $7.50...what a deal! It needed a little bit of red on it to balance out the color, so I painted it red around the edges. My mom found the rug at Dollar General for only $12! It really helps to bring in some color on the boring carpet. I found the little chalkboard at a thrift store I love to visit. I painted it white and distressed it. I asked Chase what he wanted me to write on it and that's what he came up with! It's a side way face he uses when talking to his friends on the computer. lol...Oh, and Kevin found the guitar and amp at a yard sale for $25. My friend Sherry gave me this idea. She said to do a solid curtain and add stripes around the bottom, so this is what I came up with. I had the black curtain made and glued two strips of gray and black and white trim around the bottom. Not the greatest pic...The dresser was plain brown wood with brass pulls. I painted the pulls black and brushed on some black paint to give it a distressed look. Kevin said it looks like it's burnt! Ok...I'll take that! lol... I found the rock n roll iron band wall piece at Hobby Lobby. I just found this frame at Hobby Lobby the other day. They are starting to carry more music accessories. Here is the other side of the room with the desk/hutch combo I have showed you before. I am letting Chase put what he wants in it, but I might tweak it a bit...lol. BTW, the chair came from Wal-mart, it was only $29! He has his army men set up just how he wants them. I DARE not touch them! lol...believe me, he will know if I do! You might remember the room before...this pic is all I could find. Here he is chillin in his new room! For the most part this room is done. I still have a cork board I am going to paint and of course we will finish adding some accessories to those shelves. Other than that, I think it's done! Hope you like it...it's definitely a little different than what I expected. Also, this room was done on a tight budget! We spent around $750 including the mattress and boxsprings, desk/hutch, bedding and accessories. Luckily, my Mammaw had tons of records so those were free! Be sure and join me for my weekly Share Your Creations party ln Thursday, I will have the linky tool up tomorrow night! I am joining Wow Us Wednesday at Savvy Southern Style. Welcome to the fire pit patio...Sassy is here to greet you! Would you like a hamburger or hot dog? Or...maybe you would like to roast some marshmallows on a cool autumn night. lol...I would invite you over if I could! As you can see we have a grill/rack inside the pit that can be removed. I meant to take it out for the pics...oops! oh well. I've mentioned before that Kevin does alot of cooking out here, everything from hot dogs to steaks. It's kind of like camping in a way! lol...This is his favorite spot! I kept the cushions from the spring and summer months. They blended pretty well with the fall colors. I found the scarecrow pillows at Kirkland's. I thought they were pretty cute! I will have a fall giveaway soon! I'm getting some things together. I am also listing several new items in my Etsy store over the next few days. I had to put things on hold for a while, but I will be restocking now. I am also going to show you Chase's room...it's done, all except for a few accessories here and there. The solid black bedding had to go...I'll show you what I did soon. I'm joining Susan at BNOTP for Met Monday and Carrie at Dittle Dattle for Amaze Me Monday and Kim at Savvy Southern Style for Wow Us Wednesday. I have been so excited to tell you my news! I was contacted last fall about being featured in a magazine for fall decorating and crafts. I cannot disclose the name of the magazine or exactly what will be featured due to policy. Also, the feature will not come out until fall of 2012 so things could change. I can say that a wonderful crew flew in on Monday and was here all day Tuesday! It was a fun and exciting day!! I have been anticipating their arrival for a long time. Now you know why I have been so busy lately. I have been decorating and cleaning for several weeks! There is alot to do when important people are coming to your house! I have been very excited about this opportunity and can't wait until next year when the magazine comes out. It will be a long wait! Sorry I can't give out anymore details...I hope you will hang with me through this adventure! It's time to share your creations! I hope you will join in on the fun! Since Halloween is just around the corner I thought I would feature some of your spooky projects! 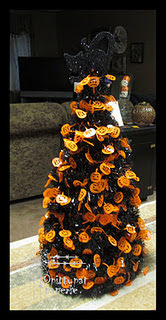 This Halloween tree was created by Diane at Pitty Pat Paperie...Cute! This festive tablescape was created by Debbie at Debbiedoos. Scary but very cool! Visit Deep in the heart of Arkansas for the link to the tutorial on how to make these cute candy corns. This mummy was made out of a pringles can. Visit Sarah at Alderberry Hill for the tutorial. Visit Ditto Decorating for the tutorial on this cute and fun pumpkin wreath. This week I created a fall tablescape using fresh flowers, wheat, and stems of a burning bush that I cut on the side of the house. They are starting to turn a beautiful bright shade of red. I went with a leaf theme as you can see. I found the napkin holders at Bed Bath and Beyond and the leaf dishes came from Wal-mart. The red plates are from Pier 1 Imports...my favorite place! I just love the colors of fall!! I also did a little island tablescape using fresh pumpkins, gourds and fresh stems...not sure what those are but they are neat! I spy another new rug! Oh my! lol... I think we are on number 999! You can link any item you have created, any room or outdoor space you have decorated, a piece of furniture you have painted...the list goes on and on. Also, if you have an Etsy store you are welcome to add a link to your store on your blog. All I ask is that you link back to me so others can find the party. The Kitchen Is Ready For Fall!